There is an on-going debate among marketers about which is more important – content or distribution. It has been discussed at epic proportions among industry thought leaders since company blogs first grew in popularity. And people feel passionate one way or the other. They make a solid point. You can pay to drive all of the traffic in the world to your website but if you don’t have interesting, relevant content, people will just bounce off your page. However, the other side contends that even if you do succeed in creating the perfect piece of content, it will mean nothing if you don’t use the proper distribution methods to get it seen. You’ll just have another proverbial tree in the woods. Perhaps the reason this debate is persisting is because there is not one right answer. It’s as pointless as trying to figure out which came first, the chicken or the egg. Of course great content is critical to the success of a business. Storytelling is an art that has the ability to engage customers with material that can actually help them. Images can speak a thousand words. And like so many great experts have said, content truly is King. But it means nothing without a well-planned and executed strategy. 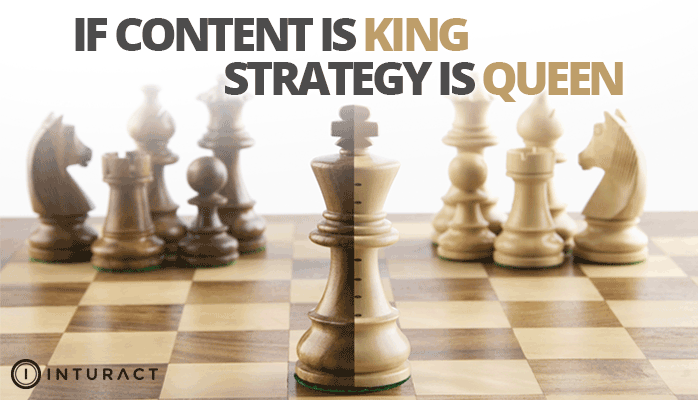 And that is why I would say that if content is King, strategy is Queen and together they will help you rule your domain. Understanding the importance of the marriage between content and strategy is critical to the entire content marketing process. You should take your content distribution strategy into consideration at every stage of your content development. When outreaching your content to influential people or websites, design the content with value for their readers in mind as well as your own. The content should be a medley of both of your needs, otherwise they will see right through your (let’s be honest) shameless attempts at self-promotion. Think about it. Why would they want to place your content on their site if it doesn’t add value to their readers? It is a fundamental principle of inbound marketing to add value for the consumer. The idea is that if you can help them work through solving their problem, they will develop trust for your brand and want to work with you. Your influencers are hoping to add that same value for their readers as well. Similarly, if you want your readers to share your content, make it easy for them! (Click to tweet!) Include shareable sections of content with a click to tweet button already highlighted for them. This simple nudge will remind them that if they like what they are reading and find it helpful, their friends will likely feel the same. The best content is a living, breathing entity. As bloggers, we all hope that the buck doesn’t stop with us. Often times, the readers will have even better suggestions to add to the topic, and getting their feedback on your page adds social proof that the content is worth their time. So don’t be afraid to ask. Format your article so that it reads as a kicking off point. Then at the end ask them directly to add their own thoughts to the conversation. You may have mastered the art of crafting a call to action at the end of your content that helps move the consumer through the buyer journey. But there is so much more that can be done to help your content get seen in the first place. Most of us don’t have the content marketing budget to recruit Ellen DeGeneres to take a selfie with a dozen other celebrities at an award show in the hopes breaking the internet. A viral campaign is a noble goal and there is a lot of great information out there with ways to try to achieve it. But more often than not it’s a much better use of your time to plan ways to distribute the content to your audience. So yes, you should focus on creating remarkable, useful pieces of content that will assist your users’ navigation through all stages of their journey. But be sure that while you are developing that content, you incorporate a strategy to help your content spread. Set the goals of your campaign from the get-go, formulate a solid strategy, and work it into your epic content. That is the foundation for a great partnership. Would you like to learn more about setting attainable goals for your next piece of content? Check out our template for setting SMART goals and start strategizing for your next campaign today.